Oh. Hey. I seem to have disappeared for two months, which is a trifle embarrassing, but yadda yadda life happens yadda yadda I should probably quit something but I love all my things too much yadda. So. Can we talk about tacos instead of that? Because I don’t know about you, but for me, tacos are a constant presence in my eating life. And while I’d like to claim that this is somehow thanks to my deep heritage as a multi-generational Texan, honestly I grew up on Taco Bell and Old El Paso taco kits. My tastes have changed since then, but I still have fond memories of both of those types of tacos. We didn’t eat out very much when I was little, and so it was an unexpected treat when Dad would come home from work with a 12-pack of hard tacos from Taco Bell, greasy and salty, the juices from ground beef and cheese soaking and softening the bottom curve of the thin crunchy shell. And as for the Old El Paso kits, that was family time: passing around bowls of chopped tomato and lettuce, getting up to grate more Longhorn cheddar because my little brother has skipped the vegetables in favor of filling his taco with cheese, squabbling over the last spoonful of meat resting in its red-tinged juices. Gringo tacos, ok, but they’re my history nevertheless. Ironically, considering my home state, I don’t think I had a taqueria-style taco until after I’d already gone off to college, though it was at least in my hometown. At Cafe El Chile Picoso, a taco stand with a fairly large covered seating area next to a gas station on South Street, I discovered the joys of warm corn tortillas wrapped around morsels of braised pork, or long-simmered beef tongue, or even ground beef, though the picadillo at El Chile Picoso tasted miles away from the spice packet from the grocery store. And my taco horizons have only broadened since: fish tacos on the California coast, tangy pickled cabbage butting up against the crips fried fish; tacos al pastor at Los Guachos here in Columbus, garnished ad libitum with an habanero escabeche that makes my stomach hurt, yet I can’t stop eating it; vegetarian tacos filled with black beans or red lentils, chipotle hot sauce adding a lovely smokiness to the taste. Never have a dry meat base. Have you noticed that most tacos fall apart when you pick them up? This has to do with the lack of “binding.” Mother taught us the art of moist tacos, adding in potatoes of some kind of vegetable that “holds” the meat together. The binding agent adds a moistness that is very desirable. Nothing is worse than either dry flyaway meat or greasy beadlets that leave a film on your upper palate. 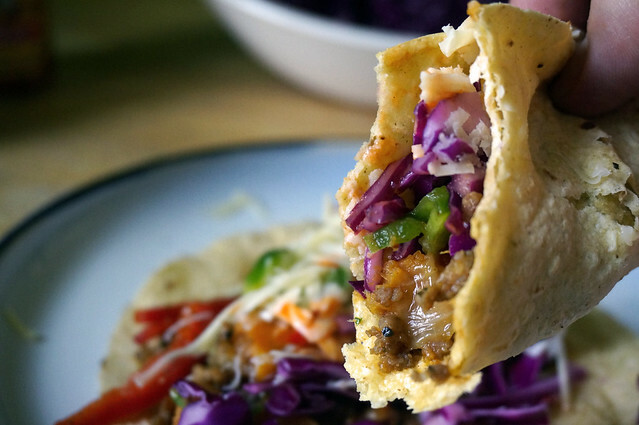 And it’s true: that’s one of the best things about these tacos, the way the sweet potato breaks down just slightly and holds the filling together, absorbing any loose liquid into a cohesive whole. It sets up a beautiful contrast with the cabbage and pickles, both of which are very lightly pickled, still crisp and brightly-colored. With some shredded cheese and a good shake of hot sauce, it all comes together into a taco that holds together as a seamless unit, but still has individual personality in all its components. So is this the nec plus ultra of tacos? One taco to rule them all? Hardly. 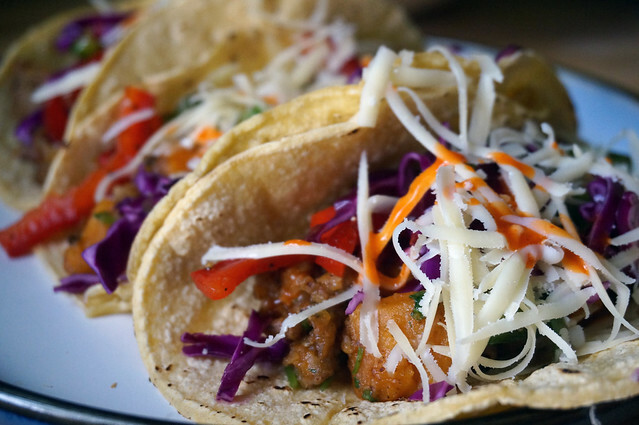 There are so many different taco styles out there, from the borderlands south to the Mexican interior, and fanning out north across the US and beyond in restaurants and home kitchens everywhere. But this is a very fine taco, and one that I was happy to make again for a photo shoot. Eating it connects me to my family and my home state, while also celebrating the bright vegetables I adore, and for that I’m grateful. Besides, as Chávez says of a Thanksgiving dinner where she made both turkey and tacos: “You can get tired of turkey but never of a good taco.” Amen, amen, amen. Happy tacos to you. 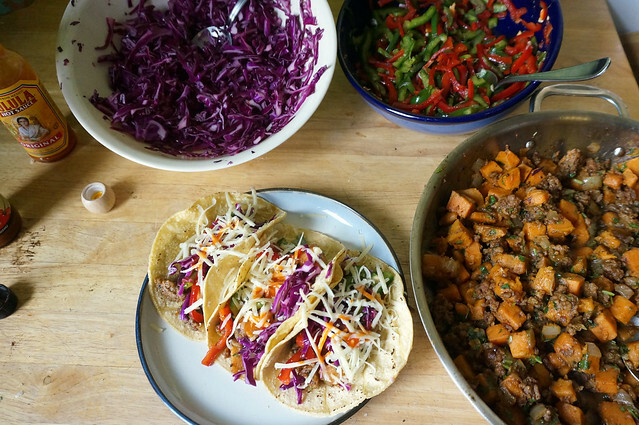 Not any one taco style, these are a mashup of some of my favorite things: warm corn tortillas, lightly marinated cabbage, sweet juicy peppers, warm velvety sweet potatoes. All the parts are great — I’d eat both the filling and either topping by themselves — but together with some cheese and hot sauce they’re out of this world. First, make the vegetable toppings, both of which need to sit and marinate while you cook the sweet potato filling. For the cabbage, shred using a knife or the slicing blade of a food processor. You want fairly thin shreds, no wider than 1/8 inch if you can manage it. Add the vinegar, salt, and sugar, and toss to combine. Let sit at room temperature. 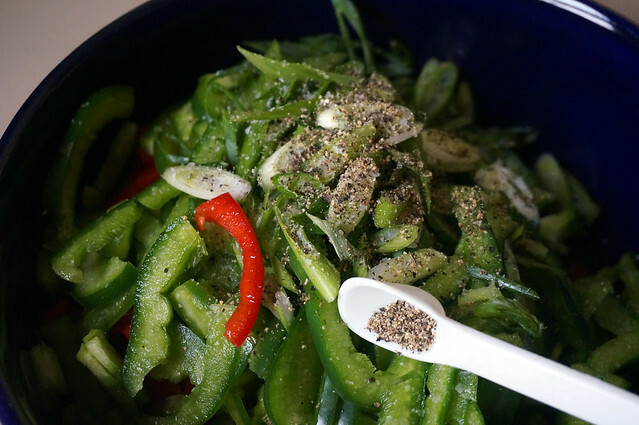 Once the onion is soft and translucent (3-5 minutes cook time), add the chili powder and salt, and stir, cooking briefly until the chili powder is fragrant. Then add the sweet potato and water, and toss to coat. Cover the skillet and reduce heat to low. 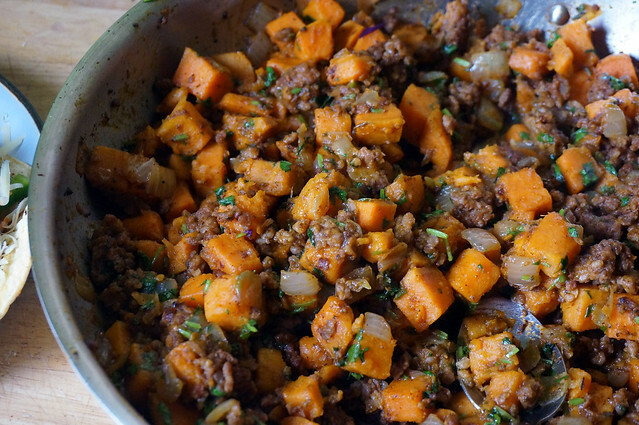 Cook, stirring occasionally, until the sweet potato is tender all the way through, 20-25 minutes. The mixture should have no standing water; if there is, cook uncovered briefly until the water evaporates. Remove from heat and fold in cilantro. To serve, use your favorite corn or flour tortillas and make tacos! A spoonful of sweet potato filling, a good pinch of cabbage and peppers, maybe a sprinkle of shredded cheese and some hot sauce or salsa, and you’re good to go. Enjoy! Vegetarians, the sweet potato filling should be quite substantial on its own without the sausage, but if you would like to bulk it up a touch you might add a couple of cups of cooked beans (i.e. a sixteen-ounce can). Black beans are the usual combo with sweet potatoes, but I think pintos would be even nicer here. 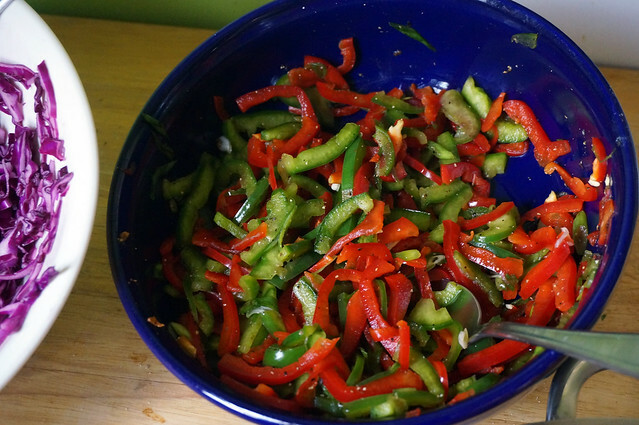 I made the peppers pretty simply, with fresh peppers lightly marinated. But this would be amazing with roasted peppers, and I’m sad I only just now thought of it. To make roasted peppers, blacken the skins in one of two ways: either broil them, turning regularly, until the skins of the peppers are all blistered and blackened, or hold them over an open flame (i.e. on a gas stove) with tongs, turning regularly, until the skins are all blistered and blackened. Either way, put the hot roasted peppers in a heatproof bowl, covered, and let them steam for 15 minutes or so. Then rub off the skins under running water and proceed as directed. Omggg this looks so awesome! 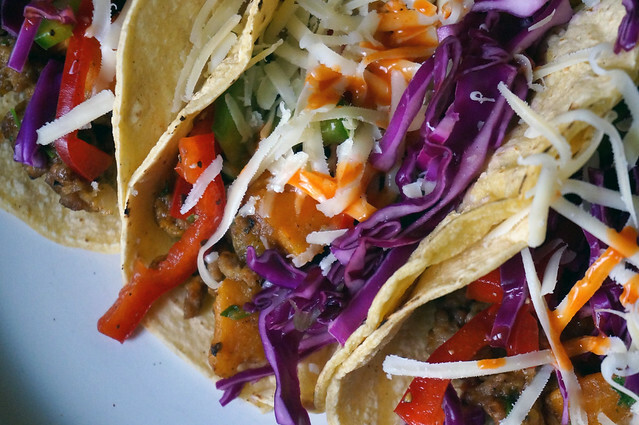 Tacos are my absolute favorite food (and that disappearing thing is totally me…). Loving your blog so much! Aw, thanks so much! I’m glad you’ve enjoyed the blog. I’ve been so buried in other stuff lately that I haven’t posted much, so that feedback means a lot to me. Enjoy the tacos!